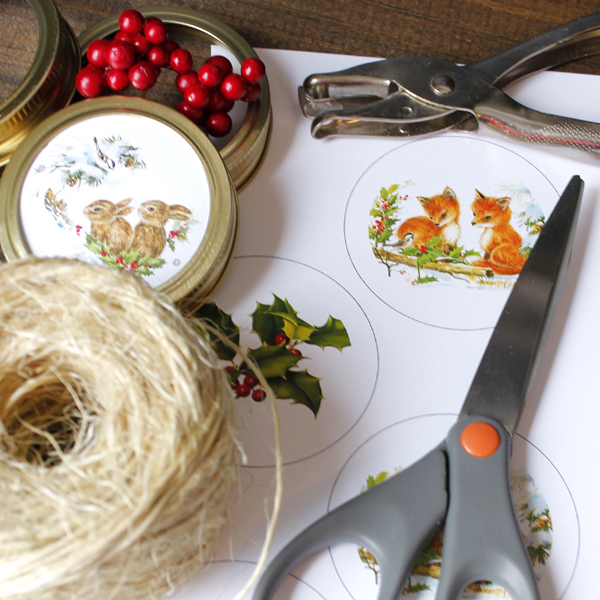 Hi everyone, it’s Andrea from The Cottage Market and I am back with you today to share one more quick and easy Christmas DIY with you before the big day. 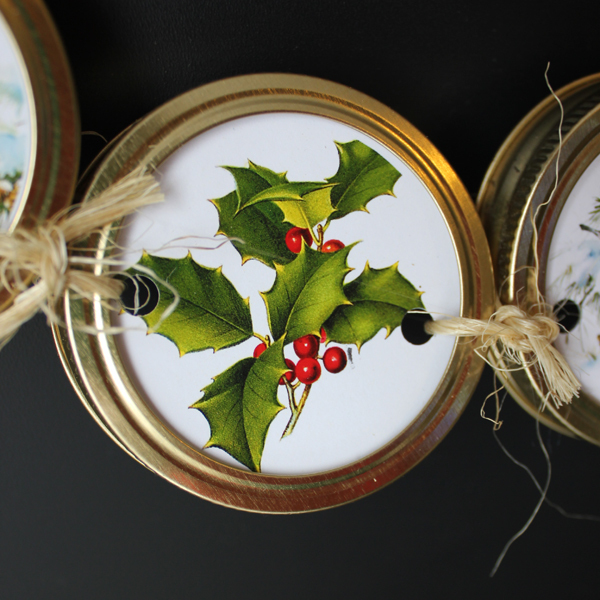 A fun Holiday Mason Jar Lid Garland DIY that you can adapt to any holiday or any occasion…so it is a good project to bookmark for all year round use. You can create it from any one of the fabulous graphics here on The Graphics Fairy and I know you will have tons of fun finding the perfect elements. I am going to do one with some of the cool retro kitchen graphics…perfect all year round in your kitchen! Let your imagination go wild! 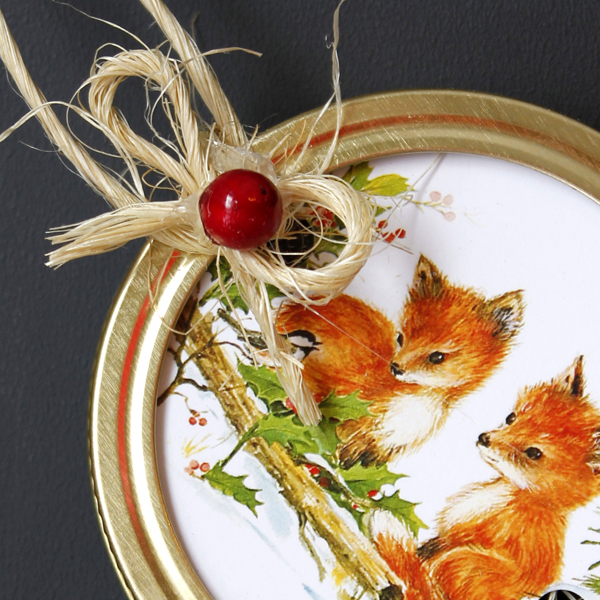 The images used here are the Holly, Bunnies and little foxes! 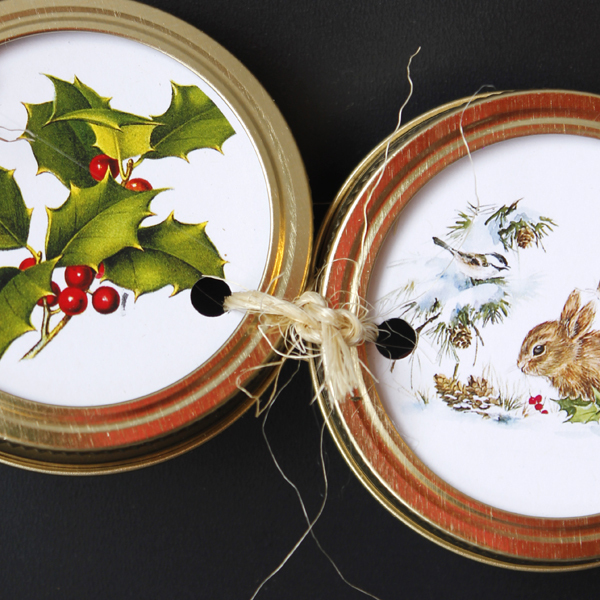 Here’s what you will need: Mason Jar Rings, Scissors, Prints of your graphic choices, twine or ribbon, embellishments if you like, hole punch, a pencil an glue. 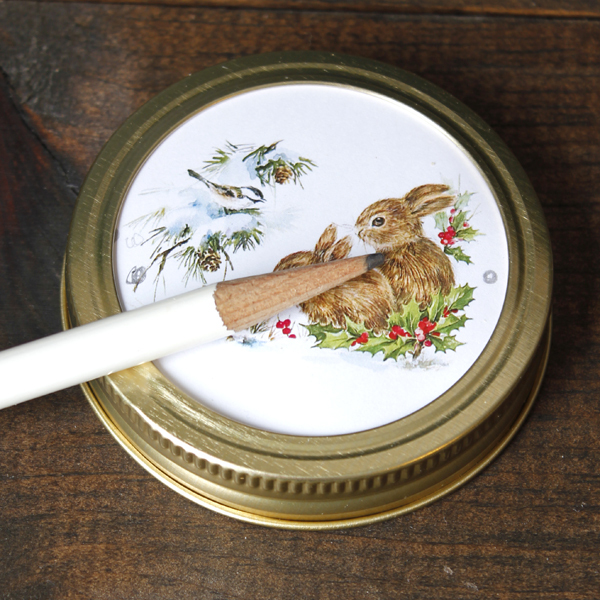 First you have to choose your images and size them down so they will fit into the mason jar lid size you choose…it’s easy because all you have to do is print the graphic and then draw a circle around the center of it using the inside lid of the mason jar. Then simply cut the graphic circle out. 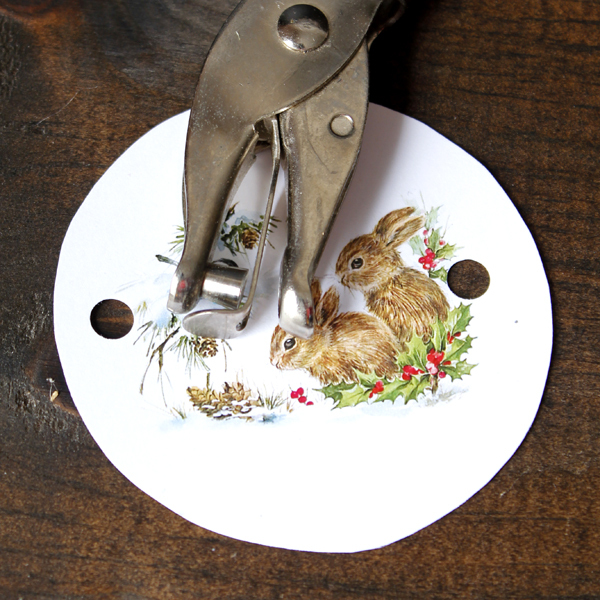 Now take the cut out image and place it in the ring so you can see see where you need to make a mark to punch the holes. Now punch the holes on both sides. 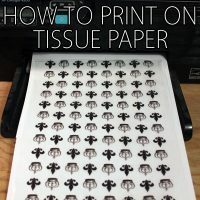 Run a fine stream of craft glue inside the rim and then place your image face side down…press lightly and allow to dry. 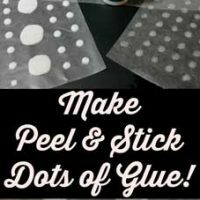 Or you can just use a few dabs of hot glue…totally your choice. then repeat until you get to the length you want. Then tie 2 bows and glue them to the end side and top them off with a little embellishments. 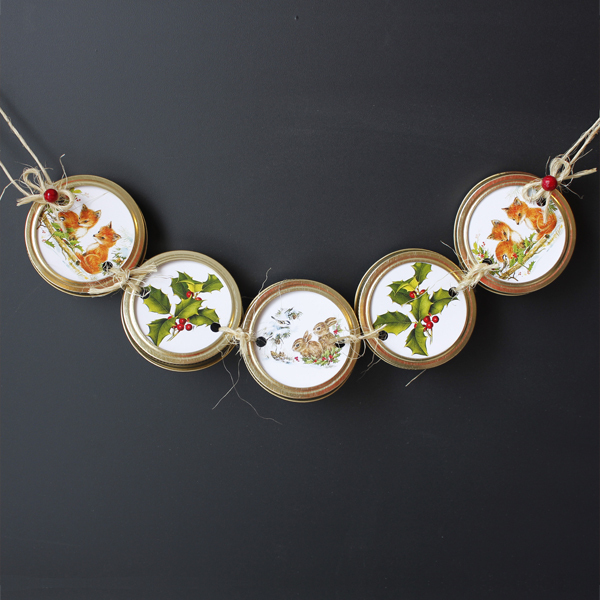 Hope you have tons of fun creating this happy garland for every occasion you can think of! The Graphics Fairy sure has the images waiting for you!!! I want to wish you and yours the HAPPIEST OF HOLIDAYS …may your days be MERRY & BRIGHT!!! See you soon…but if you would like to drop by and see me…I am always hanging out at The Cottage Market! 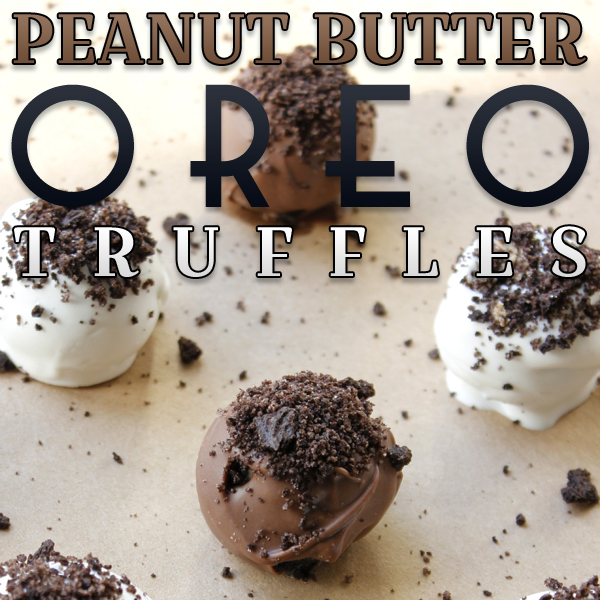 Oh and give these a try for the Holiday Season or any time at all…Chocolate Peanut Butter Oreo Truffles! « Old World Santa Holly Crown! 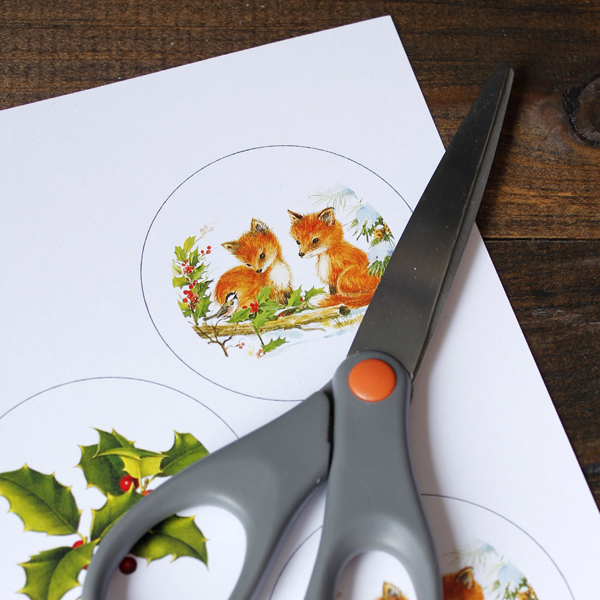 If you have circle die cuts, would make it easier to cut them out. Super cute project and garland!!! Thank you for this adorable tutorial. 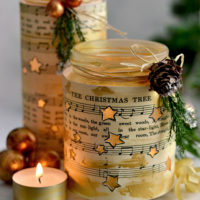 This garland is so sweet, couldn’t help going “aaaawww”.Great tutorial, have to make couple of these anyway. 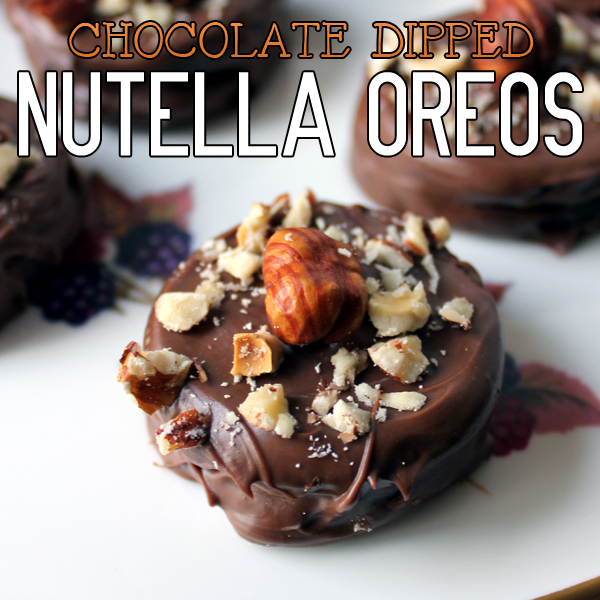 So glad you shared this. I need quick uncomplicated inexpensive gifts to make. Medical bills leave me no extra dough and don’t get paid til day after Christmas..
I’m so glad you can use this one for your gift making this year JaneEllen! Gifts are always more special when they are handmade anyway. Happy Thanksgiving to you too! What did you size down the images to? It looks like you left some white space…also how did you get the white background of the holly & ivy picture? The one I downloaded has a cream colored background. This is a guest post from Andrea over at The Cottage Market. 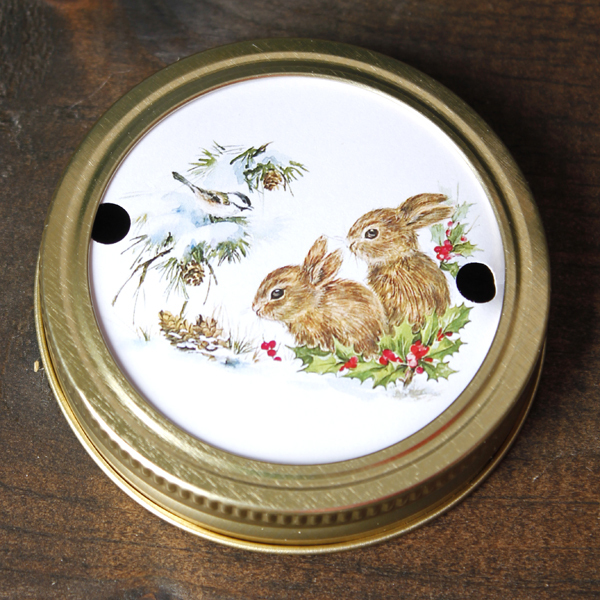 She says she downsized the image to make sure it fit the size of her mason jar lid, so you should measure the size of whatever lid you will be using and size it accordingly. She may have used an editing program to change the background as you are correct the background is a light cream in the original image. Perhaps you could give that a try 🙂 I hope that helps, Happy New Year!